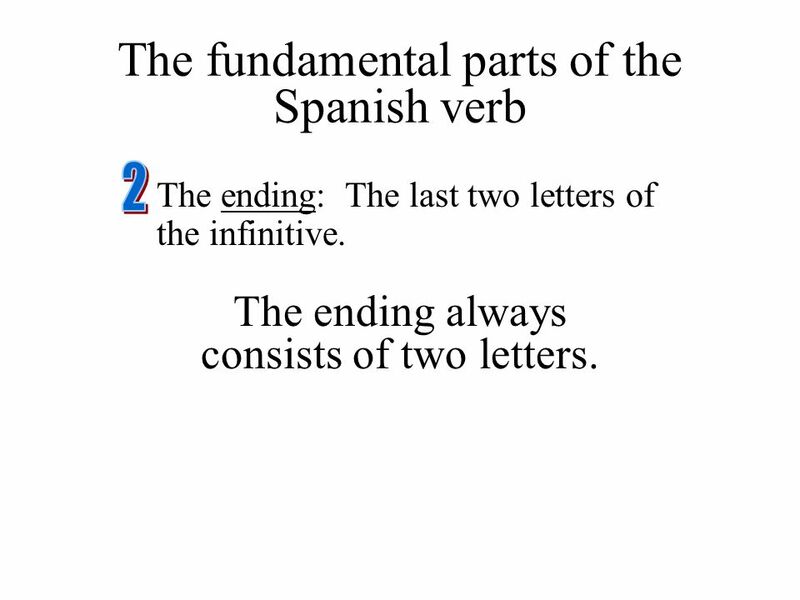 2 The ending: The last two letters of the infinitive. 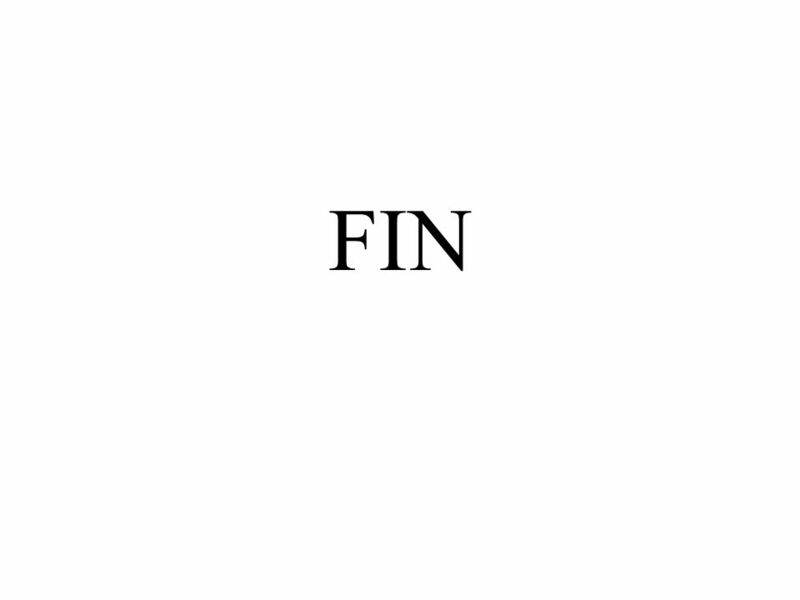 The ending always consists of two letters. 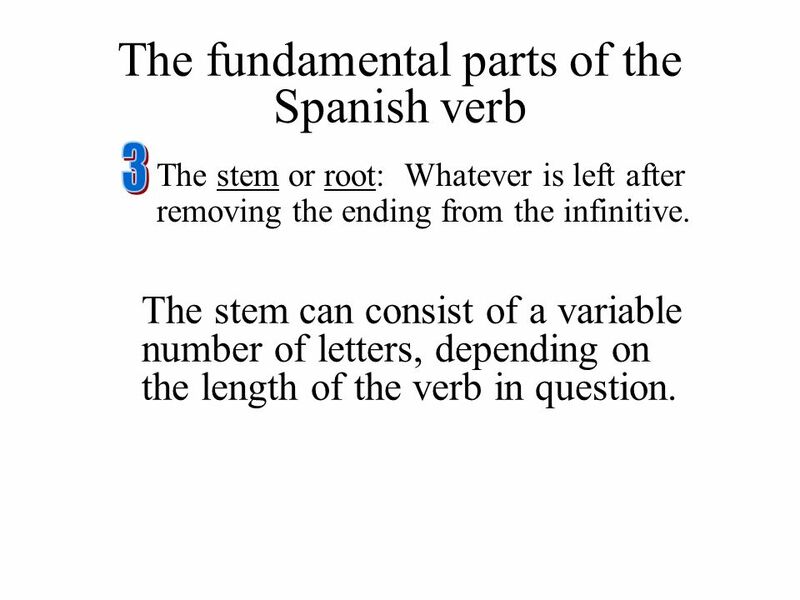 3 The stem or root: Whatever is left after removing the ending from the infinitive. 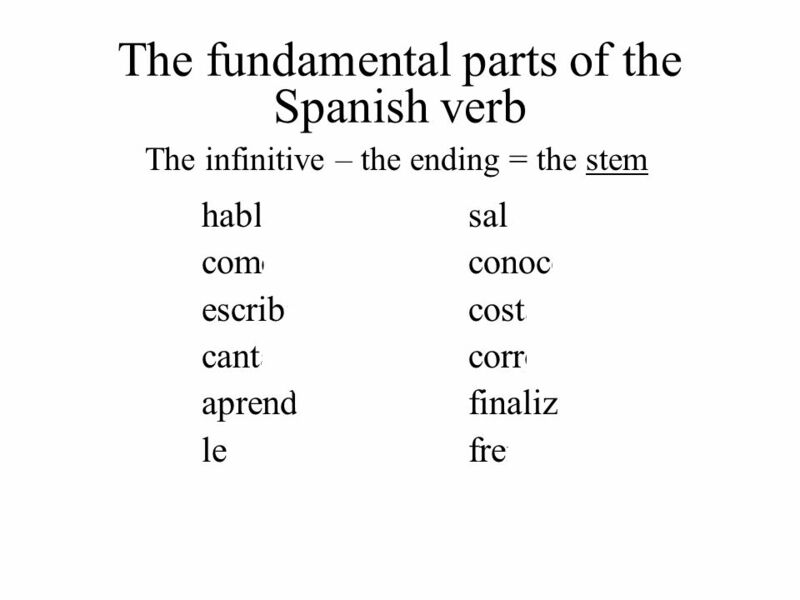 The stem can consist of a variable number of letters, depending on the length of the verb in question. 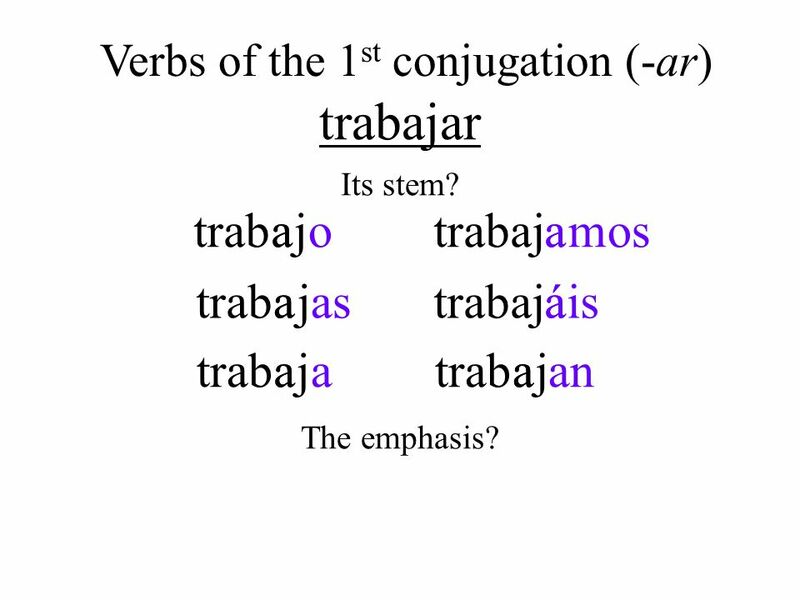 9 When we conjugate any verb we always begin with its stem. 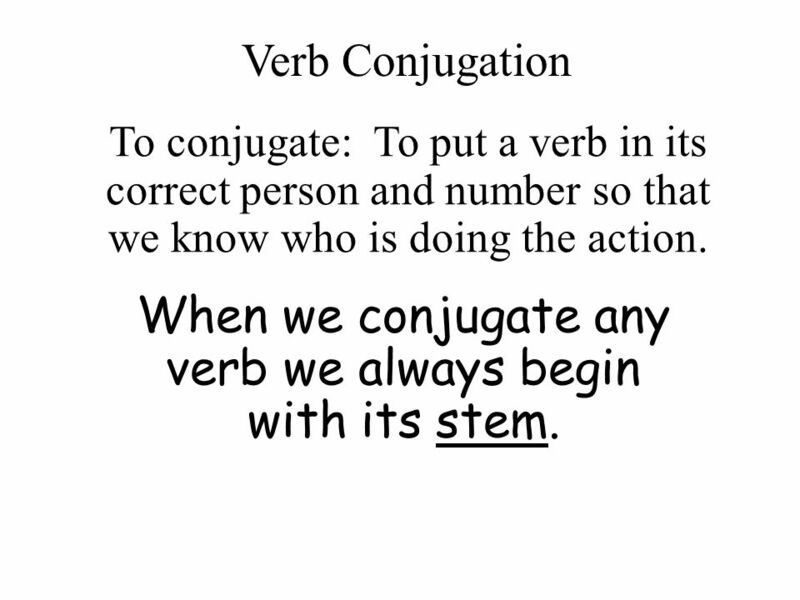 Verb Conjugation To conjugate: To put a verb in its correct person and number so that we know who is doing the action. 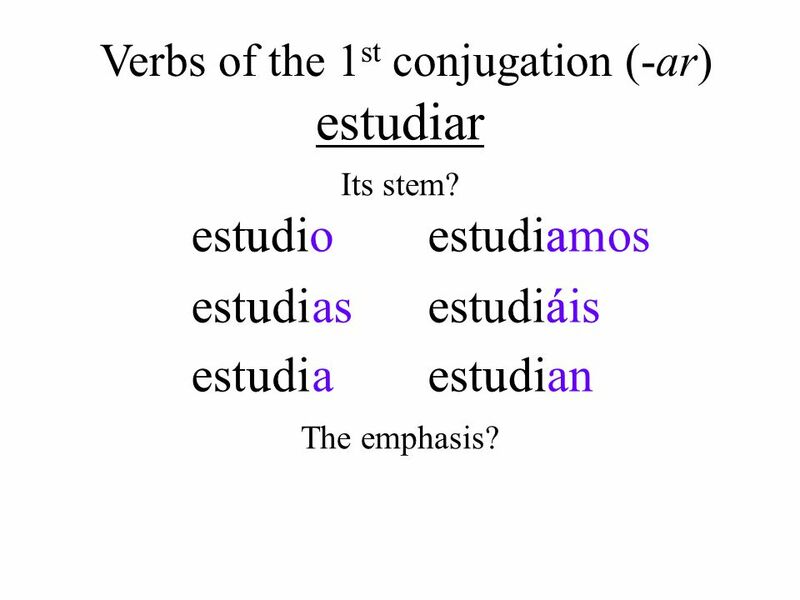 When we conjugate any verb we always begin with its stem. 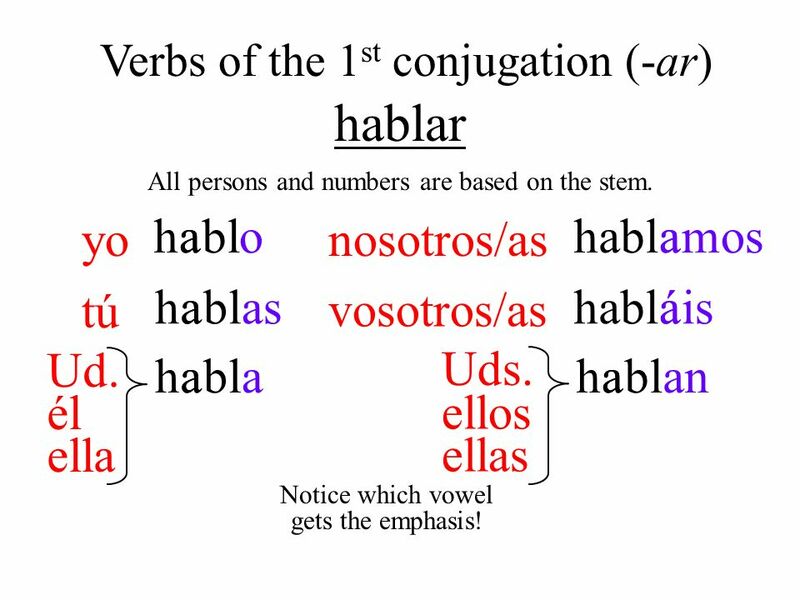 Verbs of the 1st conjugation (-ar) hablar All persons and numbers are based on the stem. yo nosotros/as h a a bl o habl a a mos tú vosotros/as h a a bl as habl á á is Ud. él ella ellos ellas Uds. h a a bl a h a a bl an Notice which vowel gets the emphasis! trabajar Its stem? trab a a j o trabaj a a mos trab a a j as trabaj á á is trab a a j a trab a a j an The emphasis? buscar Its stem? b u u sc o busc a a mos b u u sc as busc á á is b u u sc a b u u sc an The emphasis? estudiar Its stem? 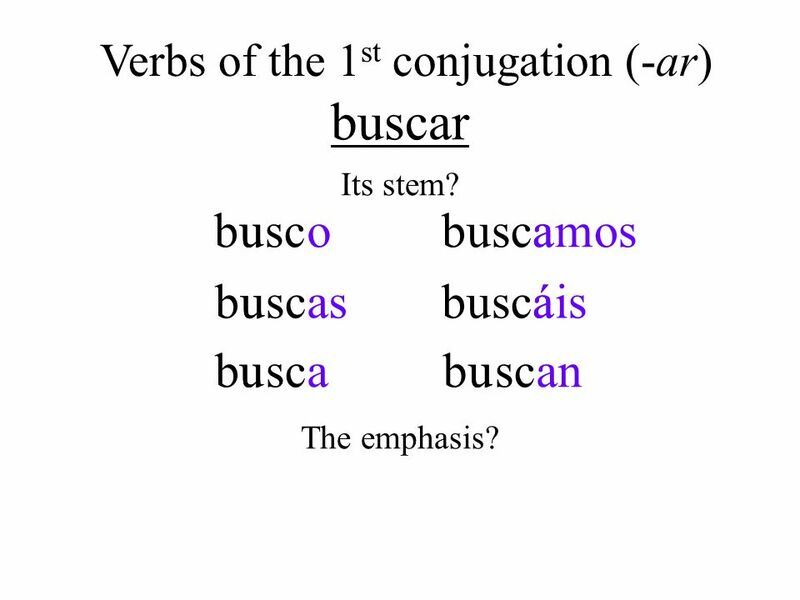 est u u di o estudi a a mos est u u di as estudi á á is est u u di a est u u di an The emphasis? 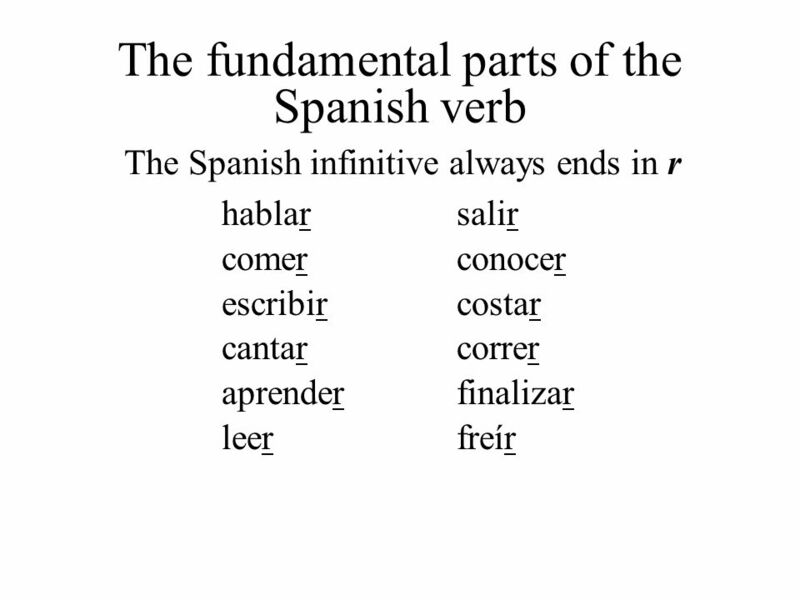 15 Verb usage The Spanish present indicative tense has several equivalents in English. 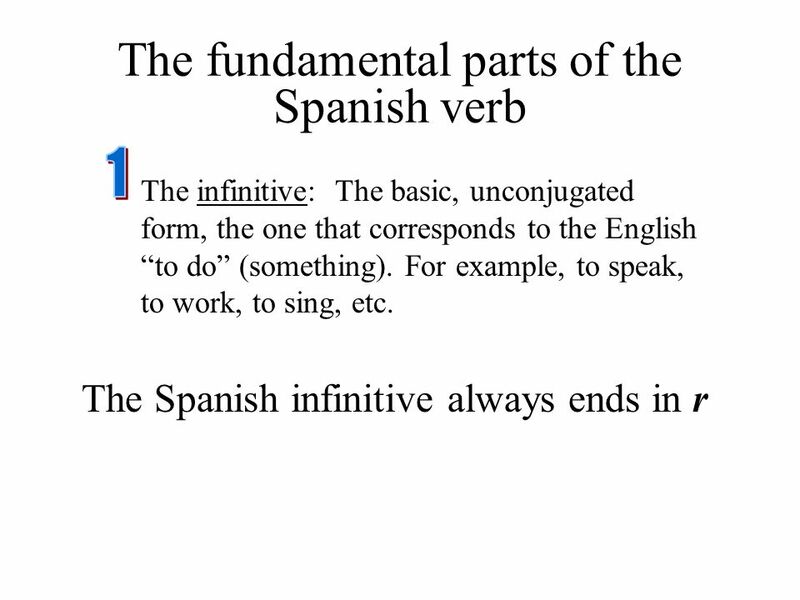 As in English, it can express present habitual actions: Estudiamos español en la universidad. 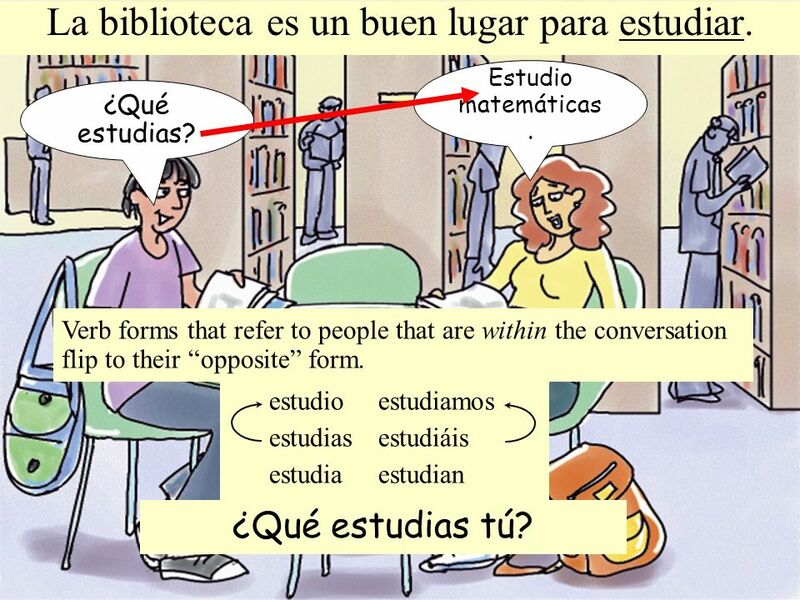 We study Spanish at the university. 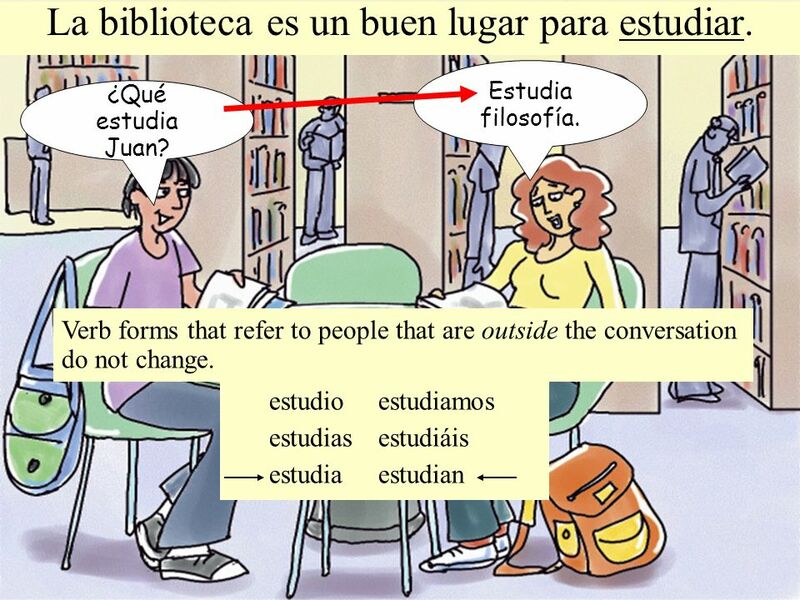 But, unlike English, it can also express ongoing actions: En este momento estudiamos en la biblioteca. Right now we’re studying in the library. 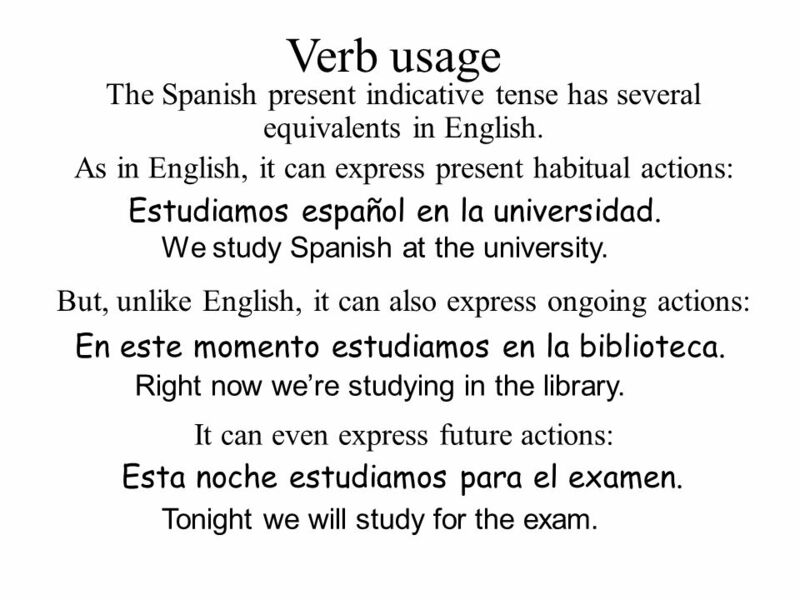 It can even express future actions: Esta noche estudiamos para el examen. Tonight we will study for the exam. 16 La biblioteca es un buen lugar para estudiar. Estudio matemáticas. ¿Qué estudias? 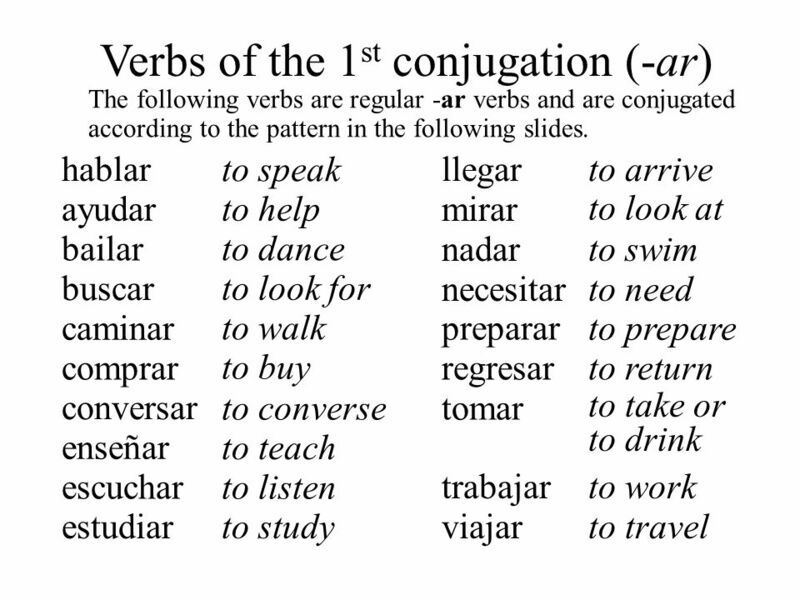 Verb forms that refer to people that are within the conversation flip to their “opposite” form. estudio	estudiamos estudias	estudiáis estudia	estudian ¿Qué estudias tú? 17 La biblioteca es un buen lugar para estudiar. 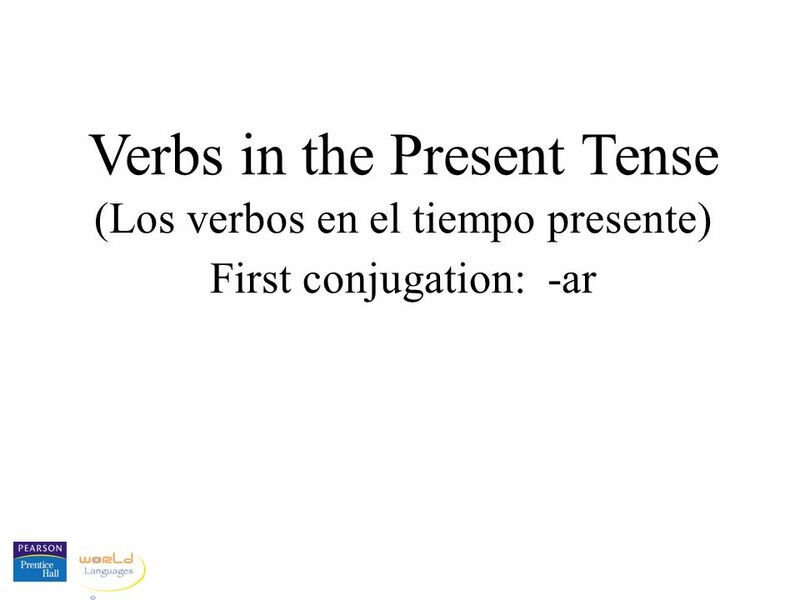 Download ppt "Verbs in the Present Tense"
AR verbs and their friend Tener. to help ……………………………………ayudar to help ……………………………………ayudar to look for……………………………………buscar to look for……………………………………buscar. 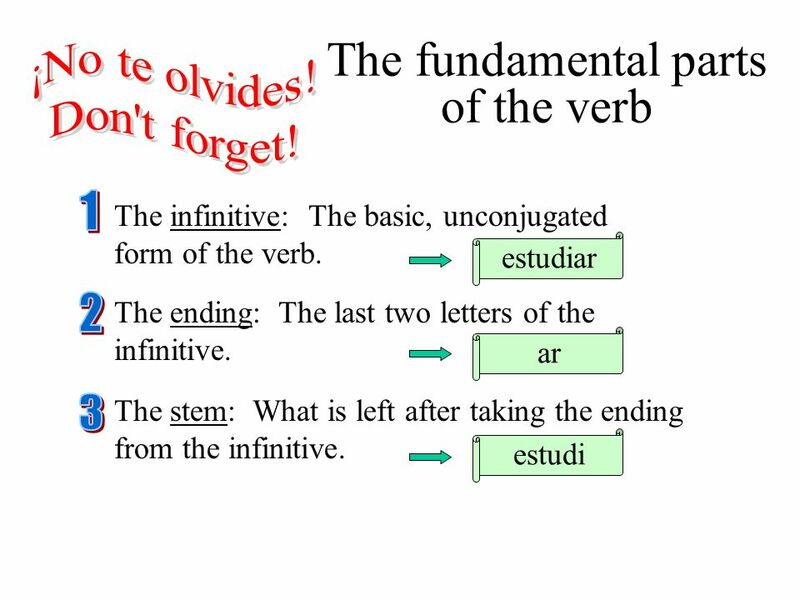 To create the forms of regular verbs, drop the infinitive endings (–ar, –er, –ir). 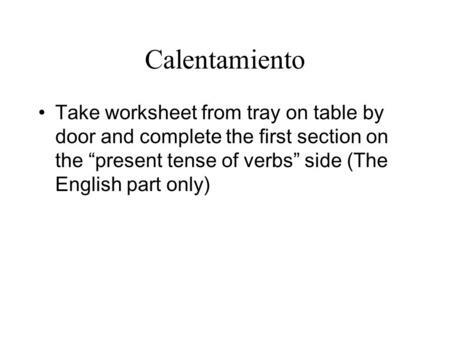 Then add the endings of the different subject pronouns. The chart below. 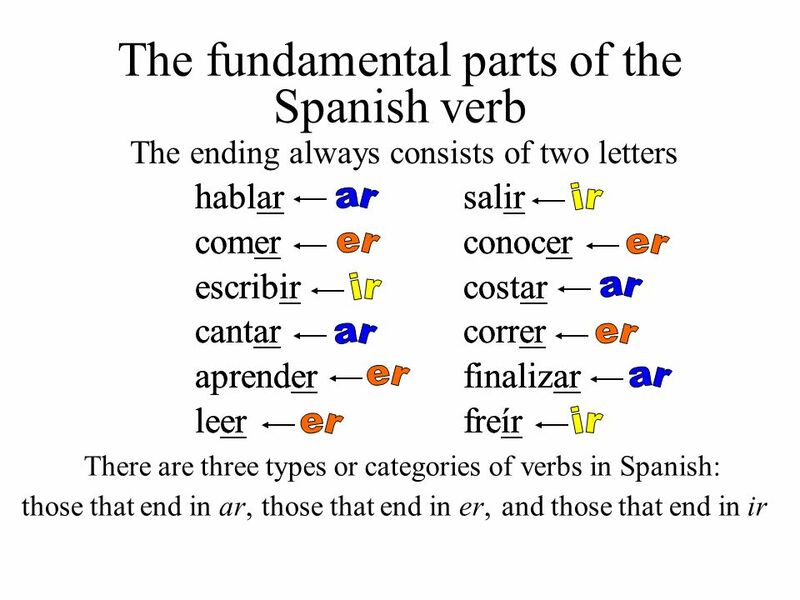 1. Review conjugating –AR, –ER, and –IR verbs 2. Play verb bingo 3. Play Mímica 4. Play board races 5. Complete our first in-class writing assignment.